To give the gift of Cheryl's. 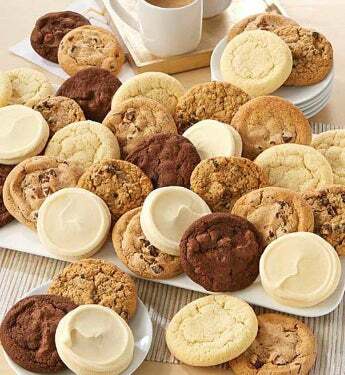 fresh-baked cookies is to give happiness from your heart to theirs. These oh-so-soft, classic cookies are sure to bring satisfied smiles to their faces with every delicious, fresh-baked bite. They’ll love the Cheryl's Chocolate Chip cookies, chewy Oatmeal Raisin cookies, Chocolate Chocolate Chip cookies, sweet Sugar Cookies and Frosted Butter Cream cookie cut-outs. Kosher, OU D.
4 Chocolate Chip cookies, 2 Oatmeal Raisin cookies, 2 Chocolate Chocolate Chip cookies, 2 Sugar cookies, 2 Frosted Round Butter Cream Cut-Out cookies. 6 Chocolate Chip cookies, 6 Oatmeal Raisin cookies, 4 Chocolate Chocolate Chip cookies, 4 Sugar cookies, 4 Frosted Round Butter Cream Cut-Out cookies. 8 Chocolate Chip cookies, 8 Oatmeal Raisin cookies, 8 Chocolate Chocolate Chip cookies, 6 Sugar cookies, 6 Frosted Round Butter Cream Cut-Out cookies. To give the gift of Cheryl's fresh-baked cookies is to give happiness from your heart to theirs.Kosher, OU D.